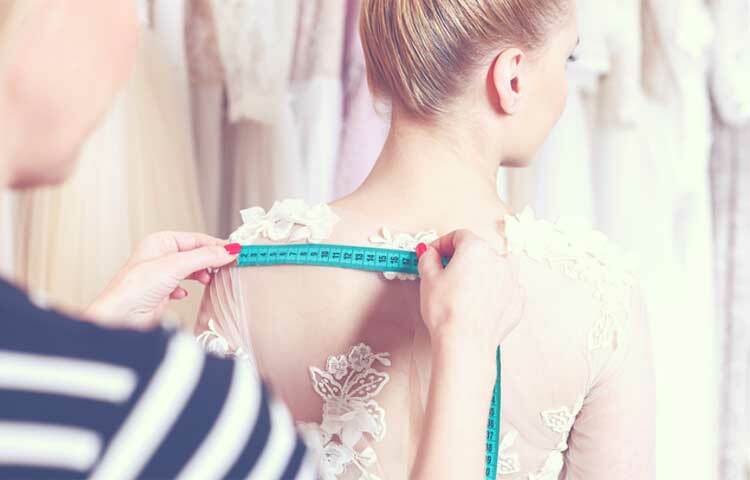 It’s time for your ﬁnal dress ﬁtting! Gaining or losing weight will cause the same dilemma: an ill-ﬁtting dress. Once your last ﬁtting is done and you are agreeable to the work, maintenance is key. A signiﬁcant change in weight—up or down—can be an issue, but too much weight loss can be a bigger ﬁt problem than a couple of added pounds. Having the dress hang poorly because of too much weight loss can ruin the silhouette. Gaining a couple of extra pounds can be resolved by a great under garment. Being good to yourself on every level should be your mission more than ever. Emotional balance will help with balance in all other areas! Exercise is a top stress-reliever, and mediation or your regular spiritual practice will help keep you on an even keel. You already know that nutritious eating is essential to maintaining your body. Yes, you’re extra busy right now, which means your body needs high-quality nutrients more than ever. For recipe ideas, take a look at the mouth-watering, colorful oﬀerings at cookveg.com and vegan-food.net. If you’re feeling pressed for time or prefer to eat out, visit VegDining.com or VegGuide.org for a global listing of veg-friendly restaurants. And don’t neglect your nightly skin care routine! Nutritious foods, exercise, and a positive attitude will maintain your inner glow, while Ecco Bella’s VitaminCells Skin Care will ensure your outer glow. So you’ll look and feel healthy on your special day!